In our Dpers unit, we took on a challenge for 5 days with the goal of making a podcast of our experience. My partner, Sige, and I took on the challenge to send voice or video recordings instead of texts for 5 days. This is our final podcast. “Where are you from?” is a question I’m asked constantly. My simple answer is Detroit ,as the truth would just be impossible to explain in a minute, leaving the other person bored. Which then leads to the question “Did you watch the last Detroit Tigers game?” which leaves me with a blank face. My life being a third culture kid has left me with no home team to cheer for with pom-poms and no food to call a traditional delicacy. Culture-hopping might seem exciting but it also takes a toll on children when they’re deprived of a “normal” childhood with deeper connections to their surroundings. I have no strong sense of national allegiance. Do you? Third culture kids (or TCK’s) are people raised in a culture other than their parents’ or the culture of the country named on their passport (where they are legally considered native) for a significant part of their early development years.They are often exposed to a greater variety of cultural influences. Third culture kids might be used to the constant culture shock but it does affect them and make them feel detached to most cultures and traditions. According to Langford (2012), TCK’s have increased tolerance towards different cultures than kids who are only exposed to one culture. This usually leads most individuals to having an identity crisis. Gabriela Alvarado, the author of “Battling an Imposed Identity: The life of a TCK Perceived as ‘Another American Girl’ ” is the offspring of a Mexican mother and a Cuban father. She was born in USA and thus is an American citizen although she lived in America only until she was two months old. On returning to USA for post-secondary education, she commented, “while I may have never identified with my country of birth, I have found that my language, education, and primary form of identification, have deemed me an ‘American’ in the eyes of the United States, provoking an identity crisis within me.” This same identity crisis plagues many third culture kids into their adulthood.This crisis determines the choices the individual makes and the life they choose in the future. An individual who, having spent a significant part of the developmental years in a culture other than the parents’ culture, develops a sense of relationship to all of the cultures while not having full ownership in any. Elements from each culture are incorporated into the life experience, but the sense of belonging is in relationship to others of similar experience says David Pollock, a sociologist and an expert on third culture kids. 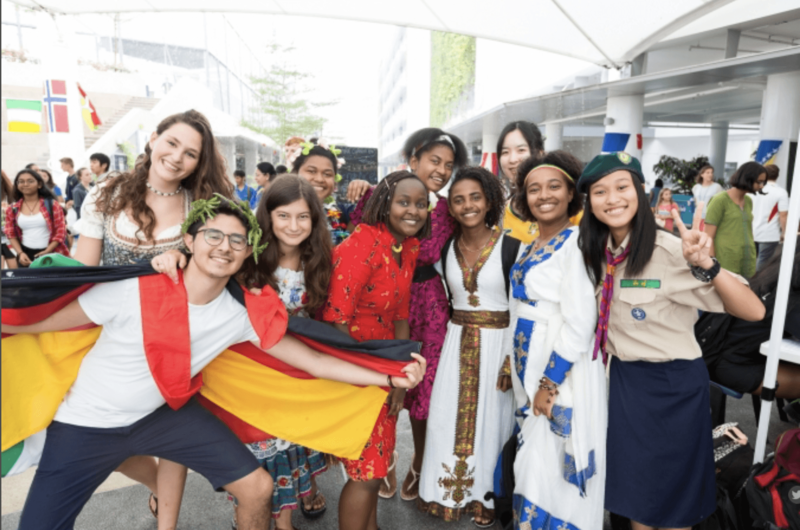 Our UWCSEA community is a very supportive diverse environment for third culture children. “Home isn’t a place, it’s a feeling, a feeling which I have regularly in this community because of its diverse and rich cultural mix which I feel I belong to”, said Swasthi Rajesh, a UWC student who has lived through four cultural changes and moves. “The world feels small to me but I feel like I am a part of all the cultures from this one place. We celebrate all traditions and festivals and have varied beliefs. This is the next generation, a modern culture” , said Owen Allwood, a UWC student. Our community has a majority of TCK’s and we celebrate each others quirks and beliefs. “I don’t have a home” said Mr.Sergey, a parent of the UWC community. Living in multiple cultures affects each individual differently, Mr.Sergey has spent his life travelling from one corner of the world to the other as has his family. The psychological impacts of leading this life are usually based on the moral of finding your identity says Ruth Van Reken, the author of the book “Growing up among worlds” about third culture kids. As Pollock’s definition says, TCKs develop a sense of relationship to all of the cultures while not having full ownership in any element. The development of relationships is affected by a TCK’s transient lifestyle because it becomes “too difficult to formulate solid and lasting relationships because there is an internal desire or restlessness to ‘change the scene’ every few years” (Tokuhama-Espinosa, 2003, p. 165-6). A TCK’s mobile lifestyle may challenge their establishment of relationships during their adult life (Mclachlan, 2007). I think my partner and I didn’t honour the partner agreement completely because both our time management skills were poor in this assignment but we worked well together in other places like helping each other when we needed to. I think we were posing important questions which made us get a better final product while also paying attention to each others ideas and thoughts. We were a cooperative team and I think I brought about some good team debates foe ideas in this collaboration. My partner was very helpful and reliable but I think In the future we have the have both our collaborative tasks on both our laptops and have better time management while doing it. I think we should have worked harder on the emotional significance of the final stop motion video as we wanted comfort but all the multiple colours and the speed of the video gave a more happy tone to the audience. We want to convey the comfort that comes from something you cherish like in this instance, hoodies. The tone is caring with showing someone you care for them that you give them something that is precious to you. There is music as we want to create a happy and comforting mood for our video, which will be light energetic music which has a fast beat. We made that decision because we wanted to have more coordination between the stop motion and the background music. Three words that describe my stop motion are colour, mood, special. Colour shows what your feeling like black shows emptiness. Mood shows the tones changing and how it progresses. Special because the hoodies are precious to the writer and they give it to someone who’s even more special than the hoodies. Can materialistic things show your true feelings? Because showing your feelings is hard and I want to understand can people look deeper and see that even a colour and tone or speed can show feelings. The episode started with a number of kids making statements about their use of electronics. From there it went into the pre- intro bumper where the host gave a quick preview of how internet is used a lot in this generation and how she was going to talk about how to balance internet time. Then she moved onto a standard introduction where she introduces herself and the company she works for .Futhermore, she talks about how this topic is relevant to everyone in today’s society by saying its changing relationships between parents and children and also making a barrier between them. Then she brings in a professional in the field for an interview and another 17 year old who used used social media to be an activist. She talks about how social media and internet can bring so much change and awareness to others but also rebels. That was where the story came in of a high school shooting and how the internet affected it. She then talks about a nine year old who abuses her freedom to use the internet to show off. The host is trying to the positive and negative sides to make the story complex and interesting. Then she talks about statistics and advice to other adults to give a solution to issues happening regarding children and the internet. After a solid debate and many details and stats she has a standard conclusion and outro. I think I have to start controlling my screen time and take a break from all social media or other apps I use constantly and see how it effects my daily life and relationships. Is social media or the internet vicious enough to break bonds? Can the internet start a revolution? IDK, I’m so stuck for this hwk. What even is respiration? Respiration is the process of oxygen reacting with glucose inside a cell to release energy, water and carbon dioxide. It is a chemical reaction. Why does it even exist, it’s so stupid? It exists because our body needs energy to function properly and carry out other life processes. How do cells even do respiration? What did that sugar bomb have to do with it? The oxygen blown and the flour react with the fire and release energy. After working with the TIF staff and collaborating our ideas with their present plans we found a number of opportunities for us to improvise and make better and more interactive lesson plans. Some opportunities were energisers and active games like “Simon says” and “ice-breakers”. We also discussed the importance of having a lot of repetition of key words through out the lesson so that the kids get the hang of the words. We were also able to link our nutrition lesson plan into there ” Living in Bintan” unit and our games of memory cards could be adapted into all their units. The TIF suggested adapting all the active games and ice breakers into their lessons. They also adapted our word games into a new unit about vehicles and transportation. The adapted activities made their present unit more contemporary with 21’st century skills like creativity, collaboration and critical thinking. The units all have a lot of team work and innovative thinking methods. Throughout this unit, I have worked with basics like walking in controlled movements to expressing my ideas freely. Honestly, this whole learning process taught me more than I could have imagined as I have never taken drama before and every new finding and lesson is a ton of knowledge. I learnt even more about the use of lights to use of sound and how every play has its significantly different characteristics which makes it what it is. In the creative process of developing this piece about displacement i was thoroughly inspired by an extract i read once in a novel and i tried to incorporate into our piece. The process was like building blocks, we started with a basic idea of losing senses and developed that step by step into something i’m proud of. The evolution of this piece from a blank paper into this final performance was just fascinating and captivating and i truly saw myself being reflected and being expressed. We used a few props and changed their meaning in each scene to show the malleability like we used rope to show waves of water which then turned into a frame which was inspired by a play we watched recently… We also used black organza to show the loss of hope and white organza to show purity and once again gain hope into the piece. This piece we made was only a starting point and the product of the past few weeks was quite good and i was satisfied with it but I also would have wanted to work more on it and make it more developed. I would also like to learn more about the sound skills after this experience as thats one thing i was not completely satisfied with in my piece. Although i would have loved to perform this piece, i think my team did a wonderful job with synchrony and control in their movements and their shift in tones from tension to peace was quite enthralling. Wellbeing, a state of being comfortable, happy and healthy. Exercise is a major part of wellbeing by being a major part that constitutes most of being healthy and happy about yourself.Exercise is any bodily activity that enhances or maintains physical fitness and overall health and wellness.I don’t think I get the regular 60 minutes of physical activity a day recommended by the Centers for Disease Control and Prevention every day but I do value working out so I do put in 4-5 hours a week in some kind of sport or core or cardio training.I love weight training or kickboxing because it engages my upper body and lower body wholly, I don’t particularly enjoy core or circuit training as its too energetic but I do realise its importance for the body…I don’t like to run or walk so I substitute that part of my workout with cross training or spinning.I swim 800-1000 metres 3 days a week to engage my core more than usual which I really like doing.In my experience I feel like we can never do something completely if we don’t enjoy or realise its importance.In my fitness regime, I like to have a few personal or fitness goals which I work towards which helps with my motivation. I don’t get much time to work out during a school day but I try to make sometime throughout the week. Honestly, I don’t like to exercise but I enjoy a few kinds of training sessions which help motivate me to do the rest. Furthermore, I wish I was capable of exercising more but I can’t really find the right kinds of motivation to focus completely on it.I’m quite satisfied with my involvement in exercise but I also believe that if we don’t exercise for ourselves and do it to please others it won’t work and we can never go through with it with the right attitude.However,the amount of exercise we do will never be enough because we’re always capable of doing more than we do.